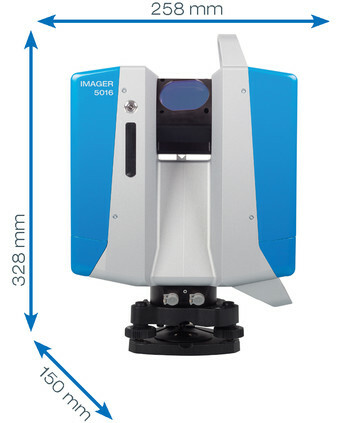 The new Z+F IMAGER® 5016 combines compact and lightweight design with state-of-the-art laser scanning technology. Due to innovative developments, the maximum range of the new Z+F IMAGER® 5016 has been extended to up to 360 m (1,180 ft) – thus establishing new opportunities and applications. The maximum measurement rate of more than 1 Mio. points/sec. guarantees highly accurate results even with long distances. The scanner is classified as „eye-safe“ according to laser class 1 and can therefore be used in public areas without any restrictions. The Z+F IMAGER® 5016 is equipped with an integrated positioning system, which allows the automatic registration in the field, with or without targets. All preprocessing tasks can be taken care on the fly, increasing efficiency. Please read the ”real-time registration” section of this brochure for more information. In addition, the scanner comes with an integrated HDR camera, which allows the user to quickly capture colour information – even in challenging lighting conditions. Capturing colour information is very important in many fields of application. Generating a full HDR panorama (80 MPixel) only takes about 3:30 min. – which is the shortest capturing time for integrated HDR cameras in terrestrial laser scanners on the market. Combined with quick scanning times, this allows the user to rapidly generate geometric and colour data. The new HDR camera of the Z+F IMAGER® 5016 is now equipped with integrated LED spots, which grant additional flexibility when scanning. No more external lighting sources are necessary when capturing images in dark environments.